The Trixie Natura Hutch 2 in 1 really has everything pet and owner could want. The integrated ramp enables your pet to access the outdoor areas. An integrated den gives it room to retreat and snooze the afternoon away. The loft can be used for storage or filled with straw for better insulation in winter. The hutch also features a closable door at ground level and a convenient detachable plastic floor that easily pulls out for cleaning. The pine wood has been treated with a special glaze and the roof features protective covering. 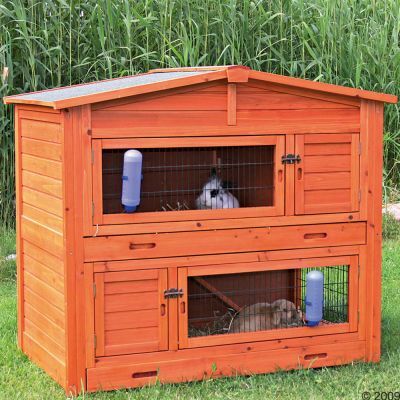 All advantages at a glance Suitable for dwarf rabbits and guinea pigs Roof halves can be individually opened from the top Premium pine Especially robust wire fencing Effortless assembly Ground level lockable door Plastic-coated floor that can be pulled out Special roof coating Hutch measurements at a glance External measurements 133 x 83 x 120 cm (LxWxH) Internal measurements 120 x 69 x 113 (incl. roof) / 104 (excl. roof) cm (LxWxH) Door size top left 72 x 30 cm (WxH) Door size top right 30 x 30 cm (WxH) Door size bottom left 30 x 30 cm (WxH) Door size bottom right 72 x 30 cm (WxH) Please note Without due care timber may dry out and become brittle warped or shabby. Please ensure your pet home is regularly cleaned and treated. We recommend treating dens and houses which will be used outside with wood care and impregnating products. Always make sure products used are suitable and harmless for pets. Placing the pet home in a sheltered spot will also help to reduce wear.